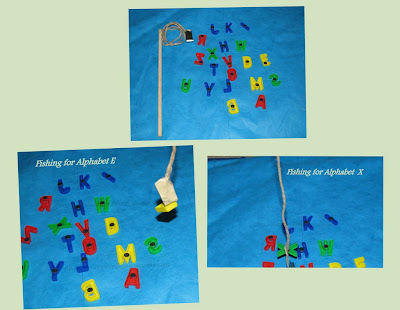 We played Alphabet fishing game with the Fishing pole we created for the 1,2,3,4,5 Once I got a fish alive activity. Can you get me an alphabet that makes 'Aa' Sound? Can you get me an alphabet that's starting letter in the word 'CAT'? Can you get me the Uppercase letter 'Z'? and we had lots of fun! Oooh we have lots of alphabet letters and what a fabulously and easy and fun way to play with them!!! Thank you for linking up to Kids Get Crafty! Great to see you there! Another easy and simple activity. I even have the letters. Now to make the fishing pole.